Today another  implementation for a fully motorized Front Loader, based on the elegant 8265 set recently released. It was done by Attila (nagyabonyiattila) from MALUG (Hungary). It includes 3 PF M-Motors, 1 PF XL-Motor, 2 PF IR Receivers and of course the battery box into a very nice looking integration work, where place for the 4 motors and receivers had to be found. A significant rebuilt work was necessary, while the original V6 piston engine was left in place, according to the author. He also made some further gearing down to make the Loader move a bit slower (forth and back) and thus more realistic, however a last modification not shown in this video. 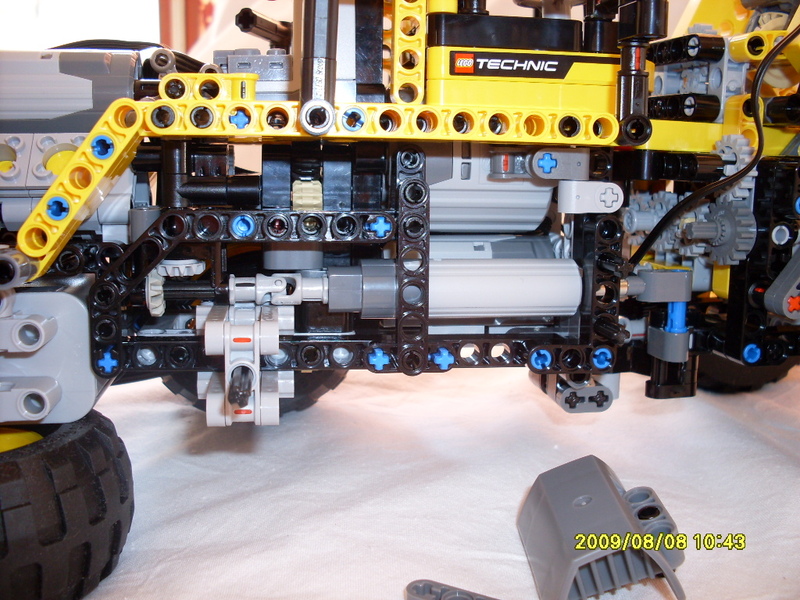 Loved the idea of using a Linear Actuator to steer the vehicle. You may find more detailed photos, at Attila's BS folder. 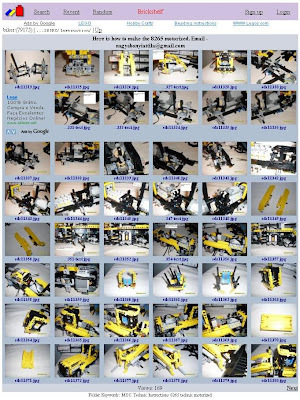 If it was not yet clear, it definitely proves this new construction machine from Markus Kossman could have been this or another year's TECHNIC flagship, if so it was the desire from the TECHNIC department at LEGO. Doubt however that TLG will ever include another set of 4 PF motors, 2 PF IR receivers and remote into a flagship model, now that the Power Functions System is well established. This was necessary for the Bulldozer (8275) and to introduce the new PFS two years ago, but not now anymore. That's what happened to Attila, so he made some instructions to help others reproducing his model. It looks Attila lost the peaceful days, since his fully motorized 8265 Front Loader got published here at TBs and YouTube. As we all know, one image worths more than a thousand words and so Attila decided to make some use of his camera. Bad luck that the model was already dismantled, but fortunately he remembered each step, so built it again while taking photos of each step. Finally everything was made public at Attila's BS folder, so you all can now reproduce it easily. Thanks Attila, for the effort making these instructions and letting us know! There's quite a few of these remote control loaders appearing on youtube. This one looks most like the original model. I'm amazed at the level of re-engineering possible. I'd love to do this myself but I don't have much of the studless bricks. This is very good and I would love to be able to do something like this if a) I had the time and b) the skills. It is good to see remodels, shows what is possible. This is a very good way of making it RCed, while still looking like the original model! I have a video of the 8258 motorized! The speed "problem" was also realized by the author, as I've mentioned in the post about his changes after this video production. Cool post as for me. I'd like to read a bit more about that matter. Thanks for sharing that data.